This is a wonderful recipe and tutorial by Free Range Mama. She explains how to make an anti-aging daily facial moisturizer with Sea Buckthorn and Green Tea. Sea buckthorn oil is extracted from whole sea buckthorn berries. This oil contains essential fatty acids, phytosterols, carotenes and more. It’s used to repair damaged skin and so is perfect for this moisturizer. Green tea has antioxidant and anti-inflammatory properties. There is a study which Free Range Mama notes that demonstrated an increase in skin elasticity when treated with topical and oral green tea. The recipe uses sea buckthorn, mango butter, green tea and other ingredients. Free Range Mama explains the benefits of each ingredient. There is a wonderfully detailed tutorial that walks you through the process of making the lotion. Please read the notes at the end of the tutorial. They contain some very good information about the moisturizer. 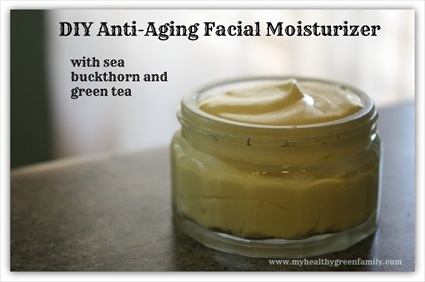 Click on the How to Make an Anti-Aging Daily Facial Moisturizer with Sea Buckthorn and Green Tea link below to see the complete article and recipe.